Carnival Fantasy arrived at its new homeport of Mobile, Ala., today to launch a schedule of year-round four- and five-day cruises to Mexico. The ship’s arrival was marked with a special invitation-only event that included a competition for charity featuring Carnival President Christine Duffy, Mobile Mayor Sandy Stimpson, President of the Mobile City Council Gina Gregory, and Carnival Fantasy Captain Bruno Palomba, as well as a traditional maritime plaque exchange between cruise line and port officials. The competition, part of Carnival’s popular Hasbro, The Game Show activities, included a $20,000 donation each to the Boys and Girls Club of Southern Alabama and Feeding the Gulf Coast. Following the event, the 2,056-passenger Carnival Fantasy departs Mobile this afternoon on a sold-out five-day cruise to Cozumel and Progreso, kicking off a year-long schedule of four- and five-day cruises to these stunning Mexican ports. 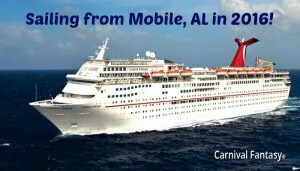 “With its Southern charm, excellent terminal facilities and easy-to-reach location, Mobile is a terrific new addition to Carnival’s homeport lineup and we’re delighted to offer these convenient and affordable cruises to Mexico’s most popular ports of call,” said Christine Duffy, president of Carnival Cruise Line. “From Mayor Sandy Stimpson and everyone at the City of Mobile to the Alabama Cruise Terminal team and the entire Mobile community, we are greatly appreciative for their partnership and the very warm welcome,” she added. Carnival Fantasy’s four-day “long weekend” itinerary departs Thursdays, calling at Cozumel. Five-day itineraries depart Monday and Saturdays, visiting Cozumel and Costa Maya or Progreso. Each of these destinations is known for beautiful white-sand beaches, interesting historical sites and attractions, and excellent snorkeling, scuba diving and watersports. During the day-long call at Progreso, guests have the opportunity to visit Chichen Itza, one of the Seven Wonders of the World, while guests visiting Cozumel can check out ancient Mayan ruins or enjoy the destination’s wide range of shopping and dining experiences. At Costa Maya, guests can explore the centuries-old Chacchoben ruins or visit the Lost Mayan Kingdom, a multi-million-dollar water-themed attraction featuring spectacular slides, an elaborate lazy river, a suspended ropes course that spans the property and more. Carnival Fantasy recently underwent an extensive dry dock during which it received many of the fleet’s latest food and beverage innovations. These include Guy’s Burger Joint, a complimentary poolside dining venue serving hand-crafted burgers and fries created by the popular chef and restaurateur, all enjoyed amid interiors celebrating Fieri’s California roots and love of car culture. Located adjacent to Guy’s Burger Joint is BlueIguana Cantina offering authentic handmade burritos and tacos along with an elaborate toppings and salsa bar. Also poolside is the Caribbean-inspired RedFrog Rum Bar, offering the region’s top rums and beers, as well as the BlueIguana Tequila Bar serving Mexican beers, margaritas and other frosty libations. Carnival Fantasy features a 12,000-square-foot spa, a WaterWorks aqua park featuring a 300-foot-long Twister slide and a kiddie splash zone, and a Serenity adults-only retreat, as well as fun, supervised programs for kids ages 2-17, full casino gambling and a wide array of additional dining options.